Book by Leningrad/St. Petersburg city council member (1990–1993) and anti-corruption investigator, Marina Salye: Mafruption, mafruption!!! Mafia and corruption, Moscow, 1994; edition: “Zakryty Club”. In this book, Marina Salier analyzes the decrees of President Yeltsin, the orders of the government at that time, and concludes that they are condoning corruption, masquerading as “increased control” and “fighting organized crime which tries to penetrate power”. Thus, the retention of export licenses has led to them becoming “expensive” — that is, they were sold for a bribe. She points out the irony over other decrees, like “the free sale of goods on the basis of a permit issued”; showing the unlimited power of civil servants at that time. Book by Leningrad/St. Petersburg city council member (1990–1993), Marina Salye, Mafruption, mafruption!!! 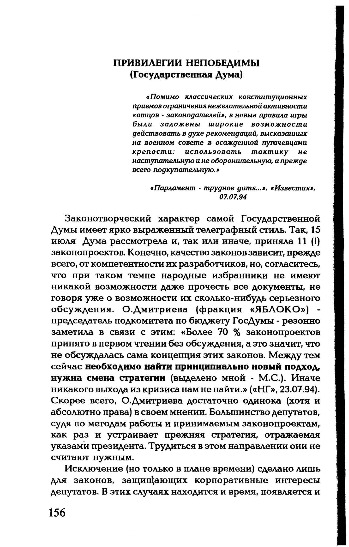 Mafia and corruption, Moscow, 1994; edition: “Zakryty Club”. Part 4. In this book, Marina Salye analyzes the decrees of President Yeltsin, the orders of the government at that time, and concludes that they are condoning corruption, masquerading as “increased control” and “fighting organized crime which tries to penetrate power”. Thus, the retention of export licenses led to them becoming “expensive” — that is, they were sold for a bribe. She points out the irony of other decrees, like “the free sale of goods on the basis of a permit issued”, showing the unlimited power of civil servants at that time. Book by Leningrad/St. Petersburg city council member (1990–1993), Marina Salye: Mafruption, mafruption!!! 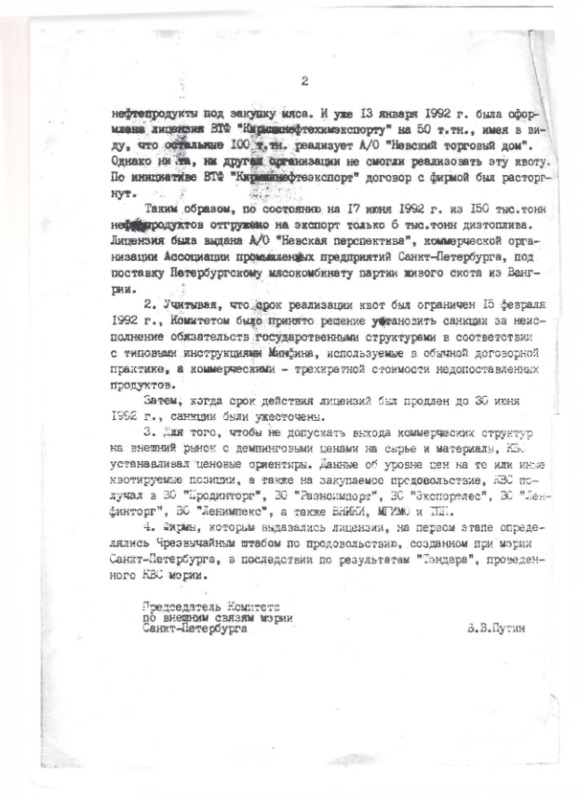 Mafia and corruption, Moscow, 1994; edition: “Zakryty Club”. Part 3. 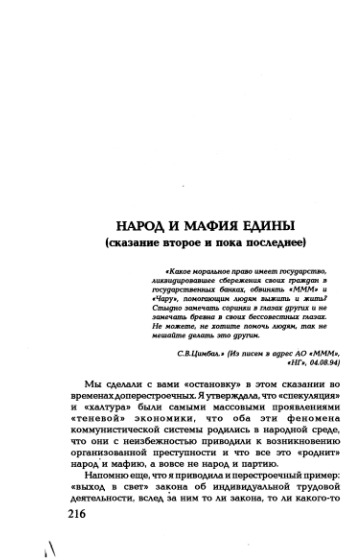 Book by Marina Salye, a Leningrad/St. Petersburg’s city council member (1990–1993), Mafruption, mafruption!!! Mafia and corruption, Moscow, 1994; edition: “Zakryty Club”. Part 2. On joint projects with foreign partners requesting additional quotas for export of energy. The additional export delivery of oil, gas, and coal in 1992 is not possible because of the exceptionally difficult balance between the production and consumption of the fuels. The Deputy Minister, Eduard GRUSHEVENKO. Formal response by Natalya TIMAKOVA, spokeswoman for the Russian President, Dmitry Medvedev, to the inquiry by the editor-in-chief of Radio Svoboda (RFE/RL — Russian edition), Lyudmila TELEN. 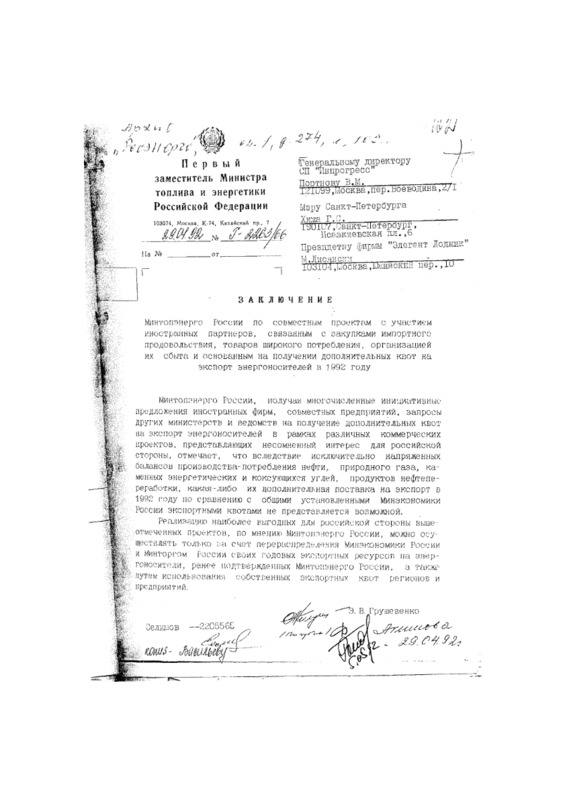 RFE/RL had requested access to archived materials on the 1992 “Salye report”, access to which required authorization from the Control Authority of the Russian President. 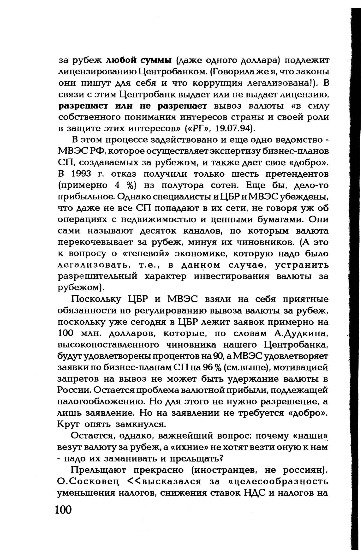 Sankt-Peterburgskie Birzhevye Vedomosti, 1 April 1992. Newspaper article: “The City Hall of St. Petersburg: 50% of city officials are honest people”, by Vera Lvova. The article covers affairs involving oil licenses and food for the city conducted by Vladimir PUTIN and other City Hall officials. 1st: “Deputies and the city hall could and should work together”. Interview with the Chief of the City Hall Committee for External Relations, Deputy Mayor of St. Petersburg, Vladimir PUTIN. PUTIN replies in his interview on complaints he did not properly manage the delivery of food to St. Petersburg in 1992. 2nd: “Is PUTIN confused by the devil?”. The story is that, while the food licenses were issued for St. Petersburg, the foods did not come to the city. The St. Petersburg Legislative Assembly investigation into this case by local deputies, Marina SALYE and Yuri GLADKOV, would find PUTIN responsible for food scandal. 3rd. “What does city mayor think about it?”. St. Petersburg mayor, Anatoly SOBCHAK, refutes all accusations against PUTIN and accuses SALYE and GLADKOV, along with journalists, of unprofessionalism. 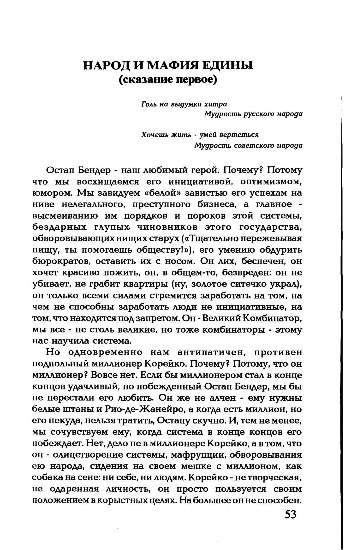 Response by Vladimir PUTIN, the Chief of the St. Petersburg City Hall’s Committee for External Relations, to complaints by Marina Salye, 1992. From Andrey Zykov’s archive.